It’s that time of the year. 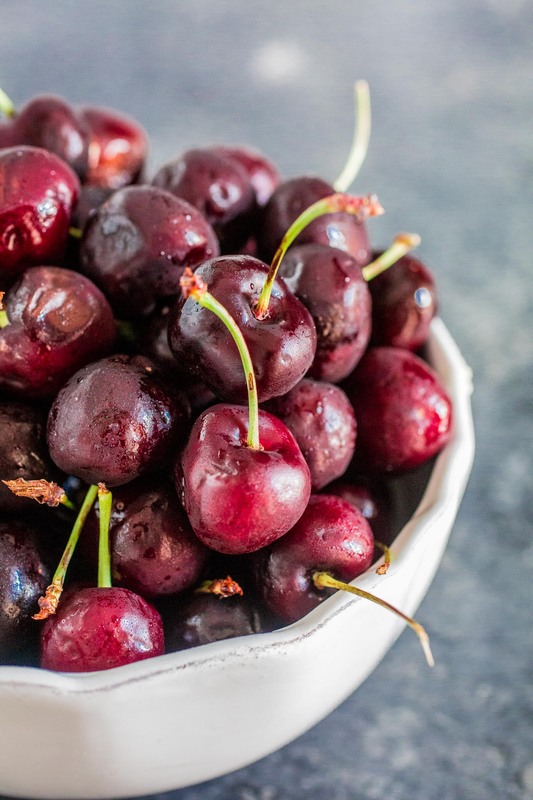 The supermarkets are overflowing with fresh summer cherries and you’ve probably bought way more cherries than what you could possibly eat. 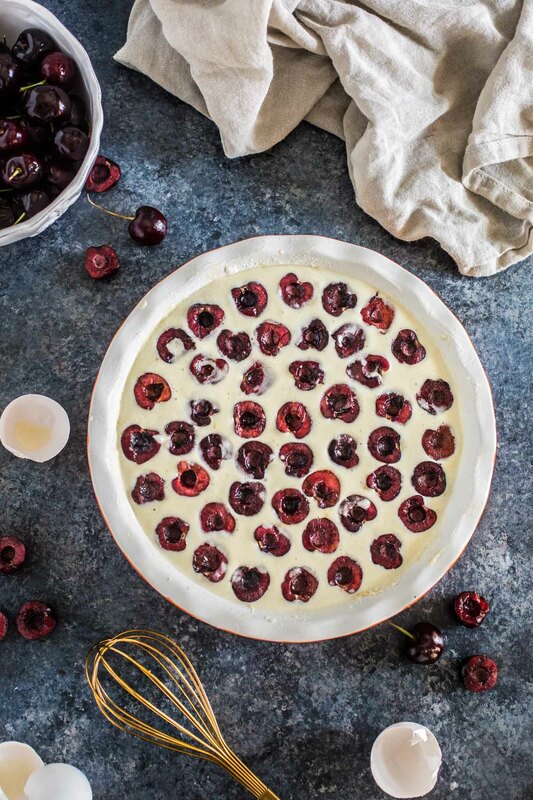 So it’s time to put some of them to good use and make this beautiful French Cherry Clafoutis! Now that 4th of July is in the past, it is time to focus on the next big food holiday: Bastille Day. ?? The perfect excuse to dust off your French cookbook (or visit international cuisine blogs, like yours truly!) and prepare all those amazing dishes that are so hard to pronounce. So let’s get the hard to pronounce part out of the way and learn to pronounce clafoutis: klah/foo/tee. Great! Congratulations. Awesome pronunciation! ? 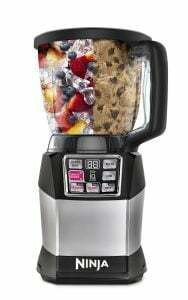 So, yeah… Use your blender! Or make it by hand, if you prefer. 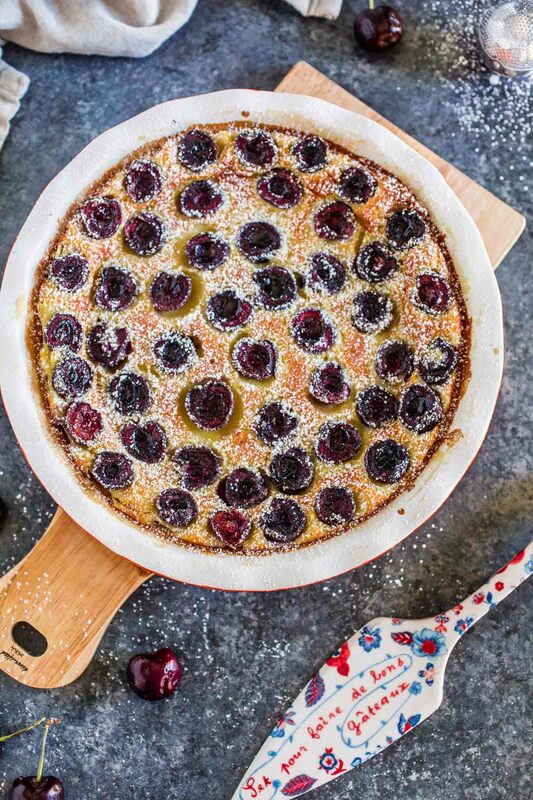 All that matters is: make this delicious Cherry Clafoutis ASAP, cause cherry season won’t be around for long! If you’ve never eaten a clafoutis before, it is a creamy, custard-based French dessert filled with fresh fruits, or in our case, cherries. It is typically served as dessert, but I like it better for brunch. Or, if I’d really like to serve it as dessert, I’d make sure to add some whipped cream or vanilla ice cream on top. It just isn’t dessert-y enough as is, at least for me. But I stand by my opinion. 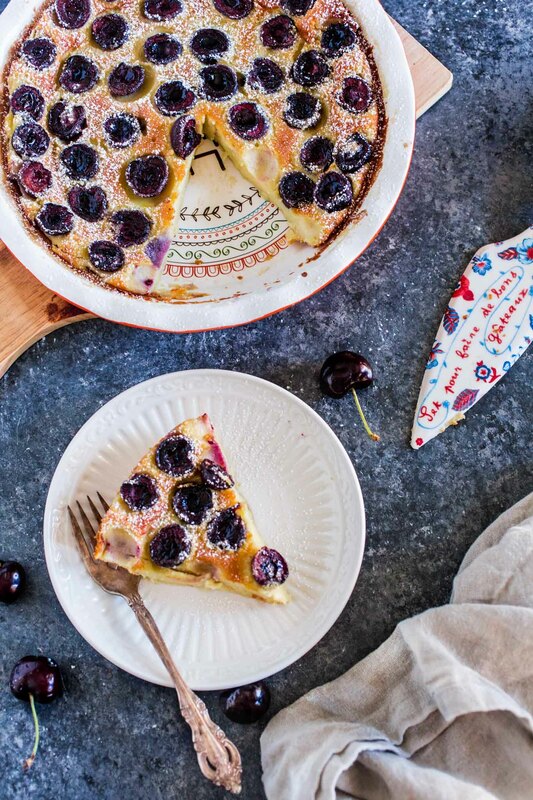 I think a Cherry Clafoutis is always a great addition to my brunch table! And the fact that it is so easy to make means it’s as easy as whipping up some pancakes. 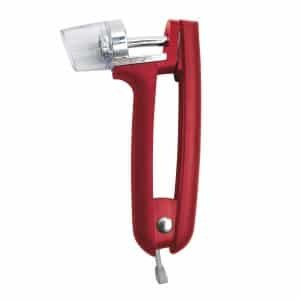 Now, as equipped as my kitchen is, there is one gadget I do not own: a cherry pitter (which is good for olives too). I will be acquiring one soon, because pitting all these cherries with a knife wasn’t fun. Ok, it wasn’t THAT bad. I just tend to be a little dramatic (and impatient)! But I highly recommend using the gadget, if you have one. Or, you could go the traditional way and not pit the cherries. I am not a fan of going to the dentist, so – even though I am VERY lazy – I prefer to go through the ordeal of pitting them than risking a broken tooth. If you happened to find this post after cherry season is long gone, do not fret! You can use any other fruits, like berries, plums, pears, figs and apples. I think if you make a clafoutis with something other than cherries, the proper name is Flaugnarde. Don’t quote me on that, though! I haven’t even been to France. Most of this deep knowledge that you see at Olivia’s Cuisine is fruit of great research. Some call it Google! ??? 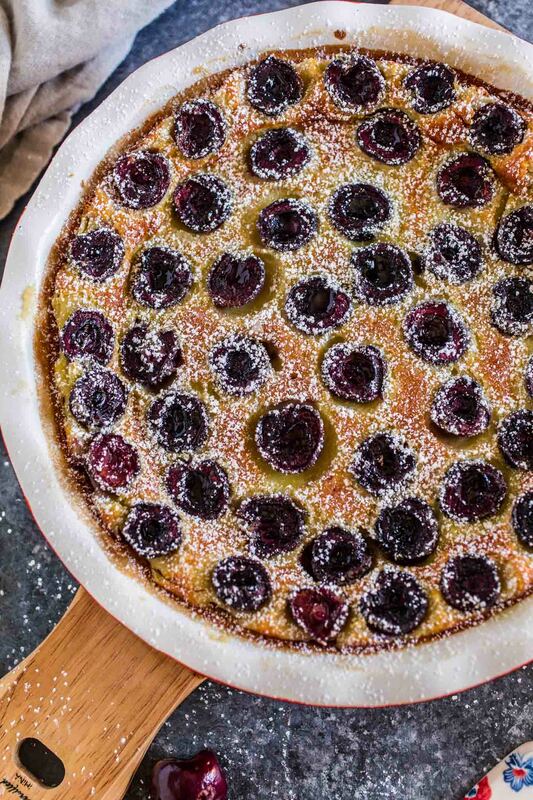 Whatever you do, do not over bake your Cherry Clafoutis. You want it to be melting in your mouth creamy, so once the custard is just set and a toothpick (or knife) emerge relatively (not totally!) clean, your clafoutis is ready! I did over bake mine a touch, but it was still delicious. But I would have preferred it a bit creamier. So whether for brunch, dessert or Bastille Day picnic, I hope you guys give this a try! And stay tuned for some more French recipes coming soon. Preheat oven to 350F degrees. 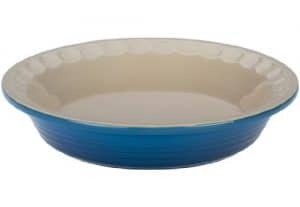 Butter and lightly flour a 9-inch round pie dish or cast iron pan. Reserve. Pour the batter into the prepared dish. Top with the cherry halves, placing them cut side up. Bake in the preheated oven for 45 minutes to one hour or until the custard is just set. A knife poked in the center should emerge relatively clean. Remove from the oven and let it cool slightly. I know you’ve heard this from me like, a million times, but I want to say it again! AWESOME PHOTOS!! I’ve had this dessert once many years ago when I was planning my wildest dream of going to France to study pastry arts and then I ended up in Turkey instead :D I made it with strawberries and loved it! The custardy texture is just wonderful!! I have made this delightful dish 50+ times and this recipe is SPOT ON. I most recently found myself one week late for being able to buy fresh Cherrys in the store and decided to try the frozen ones. I let them sit out and defrost for 30 minutes and patted them before lining my dish with them(I kept mine whole) and I also threw in a handful of Blackberries and it came out PERFECT. I agree with the No Over Baking. 45 Min is perfect. Super Easy Recipe. Enjoy! 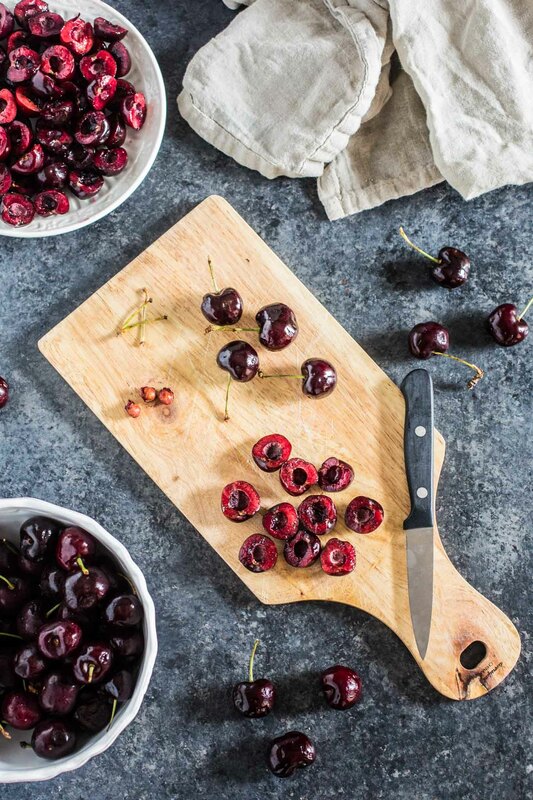 Pit the cherries easily with a common household tool: needle-nose pliers! I lived in France for two years and often find myself dreaming of certain foods. This is one of them. The recipe is perfect, not to sweet, not too custardy. What a wonderful summer dessert. Thank you. 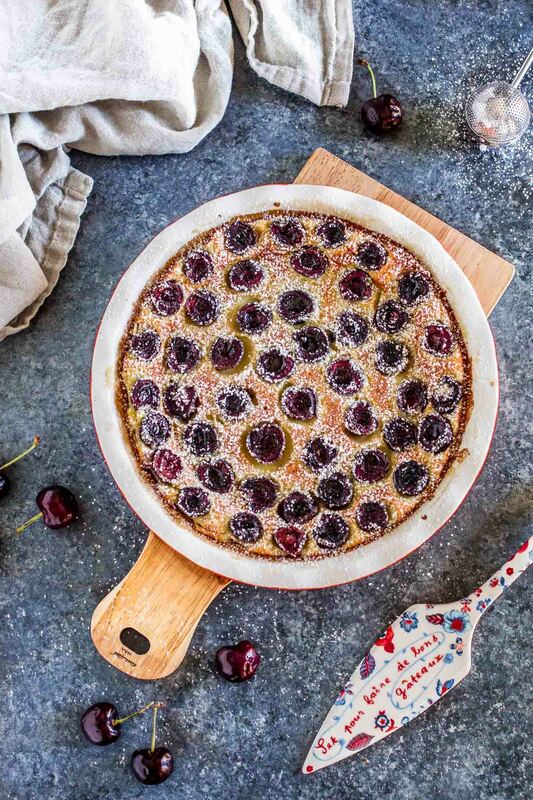 I just made your cherry clafoutis, awesome recipe, the custard so much easier than my old one. And yes, a pitted the cherries, normally I don’t, because I think they impart great flavor to the custard, but it’s my son in law’s birthday today, and I didn’t want him to have any pits on his special day! By the way it turned out perfect! I have good quality extract and used two level teaspoons anc it was plenty! Hi Melissa! That’s a good question. I always used a whole tablespoon as that was in the original recipe I learned from a French friend. It never bothered me, as I like a more prominent vanilla flavor. But I’ll add a note suggesting it can be adapted to taste! :) Thanks for the feedback.